"In the morning this feeling will be gone"
There's over one million Swarovski crystals incorporated into this production of Dreamgirls which presumably explains why ticket prices go unashamedly up to £125 - Daddy's crystal curtains, all 3 of them, don't come cheap. 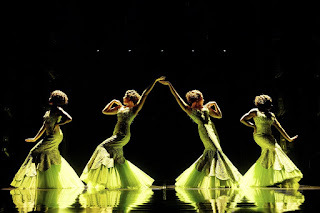 In many ways, I don't deny Dreamgirls the extravagance, it's good to have a huge rollercoaster blowout of a blockbuster musical every now and then, it helps to balance the slightly more serious-minded ones about suicide and cancer. But it helps to be wary about that creeping top line, no matter how many five star reviews this show may garner, surely such pricing cannot be allowed to become the norm in the West End. Part of the reason Dreamgirls can get away with it is that it has had a 35 year build-up. With book and lyrics by Tom Eyen and music by Henry Krieger, the original Broadway production premiered in 1981 and was a big success and though it may not have crossed the ocean, much of its music has, including cabaret staples ‘And I Am Telling You I'm Not Going’ and ‘One Night Only’. So it is hardly the risk of a new musical, though that it how is will be categorised, and thus it has been priced accordingly. Fortunately, the Savoy is not so big a theatre that the Grand Circle ain't a perfectly decent to watch the show from. 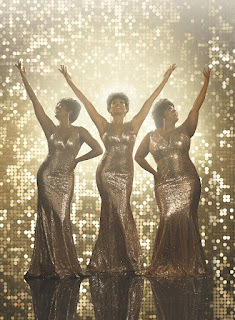 The show tells a rather thin tale of three singers, absolutely not based on the Supremes in the way that Gregg Wallace is an essential part of presenting Masterchef: the Professionals, who journey from gauche beginnings in Chicago to the heights of superstardom, experiencing all the cut-throat nature of show business along the way. 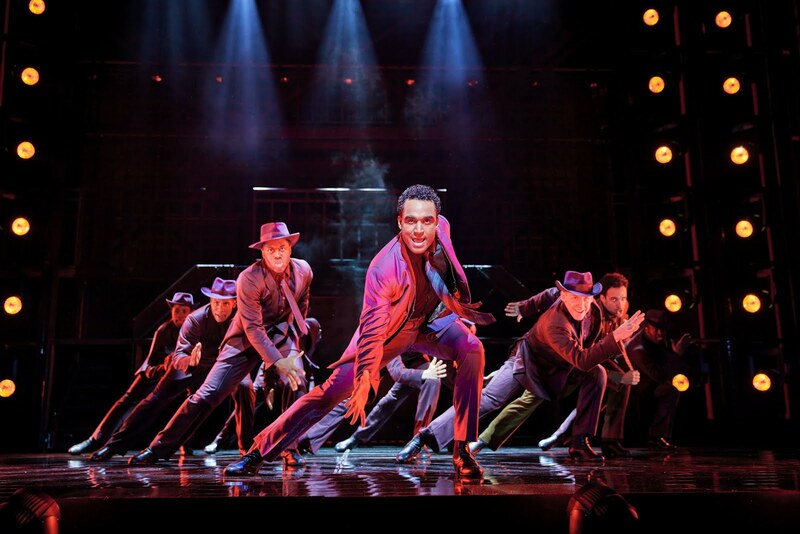 Parallel to their story is the narrative of American music history and the rise of 'black' music (qv Memphis, Motown) and it is here that the show finds its real power, tracing the struggle of The Dreams and their management to battle the racial politics of the music industry, before finding that the industry has its own internal politics that they need to fit too. Here, the changing hues and sparkliness of Gregg Barnes' costumes come into their own, as much part of the storytelling as Tim Hatley's set, and Amber Riley's Effie, Ibinabo Jack's Lorrell, and Liisi LaFontaine's Deena are a striking trio. Once the first big heartbreak moment comes, Riley comes into her own though with an astonishing ‘And I Am Telling You...’ that really lives up to the hype (I can't quite bring myself to say 'is worth the entrance price alone').Post-interval gets a little plot-heavy as a whole lot of just desserts have to be set up and then served but 'One Night Only' offers another great set-piece in Casey Nicholaw's production. Adam J Bernard and Joe Aaron Reid, not to mention Judas himself in Tyrone Huntley, represent well for the men but it is the women you'll remember and Amber Riley in particular. Much has been said about the rights and wrongs of booking for a name rather than the production but there is zero shame in wanting to see a particular performer - with that in mind, Riley doesn't perform on Wednesday evenings. At the same time though, it should be restated that this is far from a one-woman show, I just don't know if I could recommend you spend £125 on it, or on any show for that matter.